EYHP intends to be a peer-reviewed international journal, devoted to the history of psychology that pays particular attention to the interconnections between historiographical surveys and epistemological issues. The Yearbook welcomes contributions that offer precise reconstructions of specific moments, topics, and figures in the history of psychology, by means of the retrieval and critical analysis of archival as well as published sources. Critical editions of relevant primary texts or archival sources are also welcome. The national traditions in Europe are respected, not only in their own right and in their interrelations, but also in their further connections and comparisons to non-European research traditions. With this focus, the Yearbook aims to uncover paths that will aid the understanding of the common and of the specific roots of European scientific thought, and its building connections with non-European traditions. With a focus on the interdisciplinary nature of cultural studies, the Yearbook pays special attention to those common areas between psychological research and its adjacent disciplines, in particular to human and life sciences (philosophy, sociology, anthropology, psychiatry, physiology, neurology, biology, zoology, etc.). 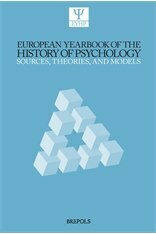 Aimed primarily at historians and philosophers of psychology, epistemologists, historians of philosophy, and historians of human sciences, the Yearbook is also open to contributions from all areas of psychology that address a phenomenon or a topic of interest in psychology from a historical perspective and/or with an epistemological approach. Besides ‘Original essays’, EYHP encompasses the following sections: ‘Short papers’; ‘Discussions’ (a space where authors can compare views and discuss specific topics); ‘Documents and archival material’; ‘Interviews’; ‘Book reviews and reading recommendations’. Allesch, Christian (University of Salzburg, Austria); Araujo, Saulo de Freitas (Federal University of Juiz de Fora, Brazil); Babini, Valeria Paola (Bologna, Italy); Baker, David B. (University of Akron, USA); Brock, Adrian C. (Bolton, UK); Carroy, Jacqueline (Centre Alexandre Koyré, Paris); Jovanović, Gordana (University of Belgrade, Serbia); Lafuente, Enrique (National Distance Education University, Madrid, Spain); León, Ramón (Ricardo Palma University, Lima, Perú); Mecacci, Luciano (Florence, Italy); Mülberger, Annette (Universitat Autònoma de Barcelona, Spain); Nicolas, Serge (Université Paris Descartes, France); Pietikäinen, Petteri, University of Helsinki, Finland); Pléh, Csaba (Central European University, Budapest, Hungary); Robinson, David K. (Truman State University, USA); Schmidgen, Henning (University of Regensburg, Germany); Sinatra, Maria (Bari, Italy); Stock, Armin (University of Würzburg, Germany); Teigen, Karl Halvor (University of Oslo, Norway); van Belzen, Jacob (University of Amsterdam, The Netherlands); Wozniak, Robert (Bryn Mawr College, USA); Zavershneva, Ekaterina (Moscow, Russia); Zeidler, Włodek (University of Finance and Management, Warsaw, Poland). These guidelines are based on COPES's Best Practice Guidelines for Journal Editors. The Journal's policy prohibits an author from submitting the same manuscript for concurrent consideration by two or more publications. The authors should ensure that they have written entirely original works and if the authors have used the work and/or words of others, that this has been appropriately cited or quoted. The editorial board members of the Journal are responsible for deciding which of the articles submitted to the Journal should be published. The editorial board is guided by the policies of the Journal's publisher and constrained by such legal requirements as shall then be in force regarding defamation, copyright infringement and plagiarism. The editorial board seeks the support of at least two reviewers in making this decision, according to a double-blind peer review procedure. Reviewers should identify relevant published work that has not been cited by the authors. Any statement that an observation, derivation, or argument had been previously reported should be accompanied by the relevant citation. A reviewer should also call to the editor's attention any substantial similarity or overlap between the manuscript under consideration and any other published paper of which they have personal knowledge. Privileged information or ideas obtained through peer review must be kept confidential and not used for personal advantage. Reviewers should not consider manuscripts in which they have conflicts of interest resulting from competitive, collaborative, or other relationships or connections with any of the authors, companies, or institutions connected to the papers.